We’d love your help. 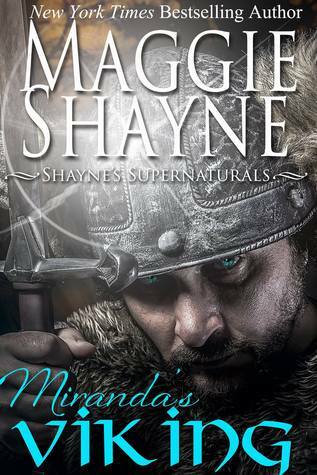 Let us know what’s wrong with this preview of Miranda's Viking by Maggie Shayne. To ask other readers questions about Miranda's Viking, please sign up. I enjoyed Miranda's Viking, it was pretty different, about a Viking hero coming back to life due to the efforts of some archaeologists. It was fun seeing the hero being suspicious at first of the heroine thinking she was someone from the past who had betrayed him and had him banished. He very quickly learns the language and is hidden by Miranda who doesn't want him to turn into a guinea pig. Miranda had a father who didn't like emotion much so she hid it and her bad experience with one man had h I enjoyed Miranda's Viking, it was pretty different, about a Viking hero coming back to life due to the efforts of some archaeologists. It was fun seeing the hero being suspicious at first of the heroine thinking she was someone from the past who had betrayed him and had him banished. He very quickly learns the language and is hidden by Miranda who doesn't want him to turn into a guinea pig. Miranda had a father who didn't like emotion much so she hid it and her bad experience with one man had her scared and wary but she stood up to Rolf. Fast paced, with a delicious hero and a down-to-earth heroine, MIRANDA'S VIKING was such a delightful read, that I kept sneaking in pages while I was at work. I didn't have the pleasure of reading it the first time around, so was very pleased when Maggie Shayne decided to re-release the book. With believable scientific detail and fabulous scenery, I enjoyed every twist to this plot and I really appreciated how they got the bad guy in the end. Bravo Ms. Shane! Miranda’s Viking is a lovely tale that crosses time, cultures, and space. Shayne did an excellent job of immediately grabbing my attention, and I was on the edge of my seat all the way through the prologue and at most other parts of this book. It was difficult to put down, and I confess, I shunned other things that needed doing to read it. Rolf, Plague of the North and the Viking found frozen in a cave and who miraculously survives the nine-hundred years from his time to ours, is a great hero. He Miranda’s Viking is a lovely tale that crosses time, cultures, and space. Shayne did an excellent job of immediately grabbing my attention, and I was on the edge of my seat all the way through the prologue and at most other parts of this book. It was difficult to put down, and I confess, I shunned other things that needed doing to read it. Rolf, Plague of the North and the Viking found frozen in a cave and who miraculously survives the nine-hundred years from his time to ours, is a great hero. He’s strong, courageous, and highly intelligent. Most of all, though, he possesses that oh so necessary perception and tenderness that every good romance hero needs if he’s honestly going to form a connection with the heroine and readers. Shayne realistically painted him as a man of his time who wasn’t a bumbling, barracking brute. He was, in essence, believable, noble, and lovable, but not in a teddy-bear sort of way. Miranda, on the other hand, tugged at my heartstrings the whole way. She beautifully combined wounded, tragic, strength, vulnerability, and tenderness. She was a good fit for Rolf and one of the better heroines I’ve read. Plus, knowing some archaeologists, she fits the part well and actually faces believable challenges like funding and international haggling over artifacts. And I love that, despite her love of the discipline, as soon as she realizes that her Viking Ice Man is still alive, she immediately chooses the humane thing and decides to conceal him from the scientific community so he’s not put in a cage and dissected slowly. I can’t believe I overlooked this book when I was trying to add all my books to GoodReads. This is by my favorite author and is still one of my favorites. This is borderline PNR . There is no time-travel (as one might suspect with this title), but the Viking hero, Rolf Magnusson, was frozen in ice in his time and thawed out (in more ways than one) by Miranda O’Shea in present day. Miranda teaches Rolf English and the many modern conveniences of today, which leads itself to many humorous moments. I can’t believe I overlooked this book when I was trying to add all my books to GoodReads. This is by my favorite author and is still one of my favorites. This is borderline PNR . There is no time-travel (as one might suspect with this title), but the Viking hero, Rolf Magnusson, was frozen in ice in his time and thawed out (in more ways than one) by Miranda O’Shea in present day. Miranda teaches Rolf English and the many modern conveniences of today, which leads itself to many humorous moments. But don’t’ be deceived, this is no ordinary romance with humor (and a some-what weak plot, being far-fetched and all) there is plenty of very believable romance and passion. Rolf and Miranda come off feeling very real and believable. This is by far one of my favorite books. I just re-read it again this weekend. I can't really tell you why I like it so much, but I keep coming back to read it again. One of the things I do really like about the book is the development of Rolf's English. Maggie Shayne did a good job of showing his progression of learning from simple phrases to longer sentences and from broken English to pretty near perfect. Very good book....could't put it down! I love it! Especially the part when Miranda overcame her fears because of an ice man turned hunk..haha! I'm ahuge Maggie Shayne fan. Light romance with fun characters that was enjoyable quick read. I liked this book alot. Maggie does a great job of making Rolf realistic. I like the storyline because its different and you don't see a ton of stories like this one. Very original! Loved it, with Maggie Shayne's books you never know what you are going to get other than quality and a great story. But what else matters? I have this book in the original paperback and recently craved yet another read but didn't feel like going through my stash to find it, so took a chance and typed it in on Amazon. Lo and behold, it's out for Kindle! Yay! Miranda is a much-degreed professor working with her father, a cold and unfeeling parent if there ever was one. While working with him on his life's work, researching the travels of an ancient Viking, they find more than they ever dreamed - the corpse of the man himself, frozen I have this book in the original paperback and recently craved yet another read but didn't feel like going through my stash to find it, so took a chance and typed it in on Amazon. Lo and behold, it's out for Kindle! Yay! Miranda is a much-degreed professor working with her father, a cold and unfeeling parent if there ever was one. While working with him on his life's work, researching the travels of an ancient Viking, they find more than they ever dreamed - the corpse of the man himself, frozen in an ice cave. The body is safely - or so they think - ensconced in their home lab, at least until thieves break in. In the struggle, the controls to the lab are knocked off kilter. No one realizes that this Viking is thawing out. And very much alive. Loved it. Exactly what I was looking for in a ‘frozen in ice love story. It didn't just start in an ice cave and leave never to return, but the whole story revolved around the frozen hibernation as Rolf learned to adjust in his new world. There was lots of good, authentic historical info about the Vikings also. The main plot wasn't very original, but the details, characters and situations were so interesting it didn't matter. Then when the action returned to the arctic cave system I was drawn i Loved it. Exactly what I was looking for in a ‘frozen in ice love story. It didn't just start in an ice cave and leave never to return, but the whole story revolved around the frozen hibernation as Rolf learned to adjust in his new world. There was lots of good, authentic historical info about the Vikings also. The main plot wasn't very original, but the details, characters and situations were so interesting it didn't matter. Then when the action returned to the arctic cave system I was drawn into the exciting conclusion. Miranda I understood. For all the belittling and lack of support, she turned out to be a very strong woman. But Rolf, for such a smart guy he wasn't very fast at catching on to her phobia. He let he’s arrogance stand in the way and he definitely was oversensitive about his history. Fave Scenes: 1) the glass of water, the bathroom, the funeral and learning to sail. I loved this book. It's one of my all time favourites. Miranda is an archeologist that discovers the body of a perfectly preserved Viking warrior in a deep cave in Greenland. She brings him back to her lab in the States to study but there are others who want the Viking for themselves. When Miranda foils an attempt to steal the ice man she discovers that the freezer she is keeping him in is damaged and the Viking is now thawed out and not too happy. Now despite some very unlikely and unrealistic e I loved this book. It's one of my all time favourites. Miranda is an archeologist that discovers the body of a perfectly preserved Viking warrior in a deep cave in Greenland. She brings him back to her lab in the States to study but there are others who want the Viking for themselves. When Miranda foils an attempt to steal the ice man she discovers that the freezer she is keeping him in is damaged and the Viking is now thawed out and not too happy. A Viking warrior was sitting in scientist Miranda O'Shea's living room, learning English and marveling over light bulbs. Yesterday Rolf Magnusson had been frozen solid, his body perfectly preserved in a glacial cave, where she'd discovered him. Today, all six feet seven inches of him was hot to the touch --- except, unfortunately, for his heart, which remained as ice-cold as he'd been for nine hundred years. Miranda couldn't just hand him over to science, but exactly what she was going to do with the man who'd gone down in history as the "Plague of the North" stumped even her. I've gotta be honest, if anybody but Shayne had written this I wouldn't have liked it nearly as well. There are just plot points and tropes that usually make me roll my eyes in here and...somehow she made me okay with it. Mostly. There was at least one eye roll. But she has this knack for making me really like her characters and always has. Even though I figured out the bad guy pretty quick I just *liked* this story. Recommend. This was a well written romance book! It was basically the plot to Encino Man, but instead of Brendan Fraser being a dumb caveman, he was an intelligent Viking with the language skills of Daryl Hannah, the mermaid. There could have been a bit more steaminess to the romantic passages, but it'll do, pig. A frozen ancient body, a robbery, and gauge for the freezer in which the body lays somehow gets broken. What is an ancient body to do but thaw? While some may scoff at the ease with which the Viking learns languages, I know someone who does this very thing, and almost this fast so I didn't even have to suspend disbelief. I've seen it. Wow what a great story this was I loved it so heart touching. Funny at times but still the love of Miranda and Rolf her Viking is truly wonderful he taught her to be free to love to let go of her fears but most of all he loved her I think from the start he loved her. Another great one from the great author. Maggie Shayne dose it again with a great book. One again I found another one of Maggie's books that I missed reading. And I am soi glad I found it. The tale of Miranda drew me in and had me believing Vikings could come to life. good. cute fun read. a couple times I wanted to smack both of them upside their heads - but then the story would not have been the same. Ms. Shayne makes the improbable probable in this book, without descending into farce. The content is well written and cleanly edited, a major plus. Le titre est plutôt trompeur : il s'agit d'un Harlequin et non pas de la SF. J'ai bien ri tellement c'était cliché, mais je n'y ai pas vu d'autre intérêt. I live in the teeny, tiny town of Taylor, NY, (Alliteration Alert!) though my mailing address is Cincinnatus, my telephone exchange is Truxton and I pay taxes and vote in Cuyler. All of these are at least in the same rural county in the southern hills of New York State; Cortland County. There are more cattle than people here. The nearest “big” cities are Syracuse and Binghamton and they are an hou I live in the teeny, tiny town of Taylor, NY, (Alliteration Alert!) though my mailing address is Cincinnatus, my telephone exchange is Truxton and I pay taxes and vote in Cuyler. All of these are at least in the same rural county in the southern hills of New York State; Cortland County. There are more cattle than people here. The nearest “big” cities are Syracuse and Binghamton and they are an hour away, in different directions, and not really all that big by most standards, though they both seem humongous to me. I look out my window to see rolling, green, thickly forested hills, wildflower laden meadows and wide open blue, blue skies. My road is barely paved. The nearest neighboring place is a 700 acre dairy farm.